Gold Softball Chenille Varsity Pins - Softball & Baseball Jewelry, etc. This Chenille looking Gold Varsity Softball Pin is perfect to wear on Jackets, Hats, Backpacks, etc. . . or as collector's Item. 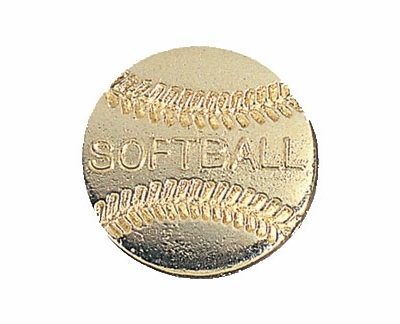 These Softball Gold Varsity Pins make a great gift for individuals or the entire team. Bright Gold Softball Pins measure 1" Diameter. * Pin contains one standard gold clutch backing.